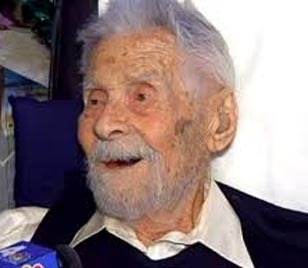 The Oldest Man in the World is a Ufologist! My friend Nadira likes to clip interesting newspaper articles, put two or three of them into an envelope and send them to me. Often they are about horrible things that very sick men in the Middle East do to women in the name of Islam (Nowhere in the Koran does it say that you must cut a woman’s feet off if her shoes make too much noise. I’ve checked. ), sometimes they are interesting animal stories about tiny kangaroos called bilbys or a cat that rides a bus in England everyday. Almost never are there clippings about UFOs. I am a person who has the nasty habit of jotting down notes on the backs of envelopes that people and businesses send me, causing me to retain a paper mess sometimes. Several days ago I was looking through some of my voluminous papers replete with odd notes featuring telephone numbers of forgotten people with no names attached and appointment times without a reference to whom I was supposed to meet or why. When I find a note that is still important and decipherable I jot it into a spiral bound note-book and then the envelope is recycled. Among these envelopes I found one from Nadira postmarked 11 OCT 2011. I had read the articles within the envelope nearly 3 years ago so the contents were familiar but vague. There was an article about voodoo in the boroughs of New York and another about how children think, but the third article really caught my attention. It was titled: A Secret to Long Life: UFOs by Ralph Gardner Jr in the Wall Street Journal April 28, 2011. This article was about then 108 year old Dr. Alexander Imich. And it made my blood boil. Imich seems like a very interesting fellow with interests that parallel mine. He practices the fairly well proven theory that a calorie restrictive diet can lengthen life. Imich has a Ph.D. in zoology and worked in the area of chemistry, yet the author Gardner, seemed to make light of that caloric restriction idea which has many science-based studies that agree. But it was Gardner’s words about UFOs and parapsychology that really bugged me. Photo of the scene on May 12, 2014 at 8 p.m. Sighting took place at approximately 9 p.m. on Tuesday April 22, 2014. The foliage on the tree was much more sparse. On Tuesday April 22, 2014 between 9 and 9:15 p.m., I was returning from dinner with my friend “G”. We had had a tasty Middle Eastern repast while talking about many things, though principally we spoke of friends and relatives who had recently passed. Thus I chose the word “repast” carefully. We took our time with eating and even split a dessert which prolonged our conversation suitably. In the interests of full disclosure, we each had one scant glass of red wine with our food. Those of you who are familiar with dining in Manhattan are quite aware of how scant a glass of wine can be! So we were in no way inebriated as we left the restaurant, nor had our conversation included anything about UFOs. We walked to the corner of Avenue A and East 10th Street which is pictured above. The photo was taken twenty days later than the actual event took place. Thus the trees in Tompkins Square Park and on the street are much leafier than on the night in question and the sky was darker then. 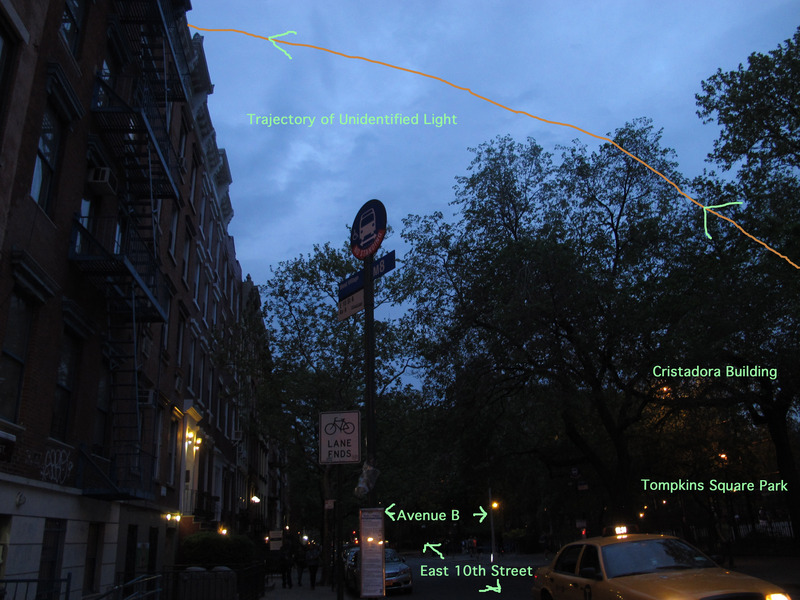 As I looked down 10th Street that night I saw an orange light above the Christadora Building on Avenue B. It was a dull, brownish orange color which seemed somewhat ovoid in shape. The trajectory was steady and traced a clean arc from our point of view. I pointed it out to “G”. At that point the light had gone out of sight behind the buildings on the north side of East 10th Street.